Starring Nick Robinson, Josh Duhamel, Jennifer Garner, Alexandra Shipp, Logan Miller, Jorge Lendeborg Jr., Katherine Lang, Miles Heizer, Talitha Bateman, Kelynan Lonsdale, Joey Pollari, Natasha Rothwell, Mackenzie Lintz, Terayle Hill, Tyler Chase, and Tony Hale. Rather than primarily focus on gay romance, Love, Simon opts to further explore the fear that one’s world will flip upside down upon coming out of the closet, and more specifically, the ever-so-important theme of identity and staying true to one’s self. Much like the heavy-handed marketing for the film (but with no eye-rolling puns), Love, Simon (based on the book Simon vs. the Homo Sapiens Agenda by Becky Albertalli) begins with teenage highschooler Simon Spier (Nick Robinson from The Kings of Summer and Jurassic World) easing us into his daily life with relevant bullet points; we quickly learn the names of his friends and get a glimpse of their personalities, are made aware that he is interested in musical theater, witness aspects of his loving home life which includes highly supportive and caring parents alongside a younger sister with cooking ambitions (all of which Simon gets along with, going so far as to fake enjoying her cuisines), but that the only thing preventing him from leading a “normal” life is that he is gay and is unsure on how to break the news to anyone, including those he trusts most. Simon isn’t necessarily worried that he will lose friends or that his parents will disown him and ship him off to a foster home (he notes in voice narration that although his father Jack, played by Josh Duhamel, cracks harmless gay jokes in privacy, his parents are progressive liberals and would accept his sexual preference), but is concerned with how the revelation of his homesexuality will affect the dynamics of those relationships, what the rest of the school would think or do (there is another gay student that is open about it which draws seemingly mixed feelings of admiration and bitterness that he can’t behave the same way), and that public disclosure of private conversations would scare off the anonymous schoolmate “Blue Eyes” he has befriended under the pseudonym of Jaqcues and confided in on a personal level after dropping the likeminded yet unknown boy (spotted on a Tumblr reminiscent service designed for the high school students to post up and share secrets) an email. From a romantic standpoint, the most beautiful aspect of Love, Simon is that through nothing but emails it’s believable that these two students could fall for one another; it’s not about physical appearances or social status or anything superficial, it’s about the bonding over being secretively gay and concerns of how life-changing the process of coming out is. All of the brewing online love quickly becomes threatened due to the convenient plot device of Simon accidentally remaining logged into Gmail on a school computer (I don’t believe for a second someone would be that careless with something this covert) which is then used by a member of the theater class, noticing the exchanges with Blue Eyes and using them as blackmail to get closer to Simon’s friend Abby (Alexandra Shipp). It should go without saying that Abby is not interested in the goofball antics and overtly nerdy presence of Martin (Logan Miller), and is actually being pursued by another friend within their circle (athlete, soccer aficionado, and analyzer of crazy dreams Nick as played by Jorge Lendeborg Jr.). Simon is also oblivious to the fact that one of his longtime and best friends Leah (Katherine Langford) has shyly been in love with him for years. What ensues is Simon making all of the wrong decisions and manipulating his own friends for the sake of the security of his own secrecy and online relationship, resulting in some coming-of-age life lessons as well. Logan Miller also deserves points for playing Martin as mildly sympathetic for his heinous actions; he never really feels like a truly bad person or cliché antagonist, but misunderstood and misguided in his methods towards winning over his crush. 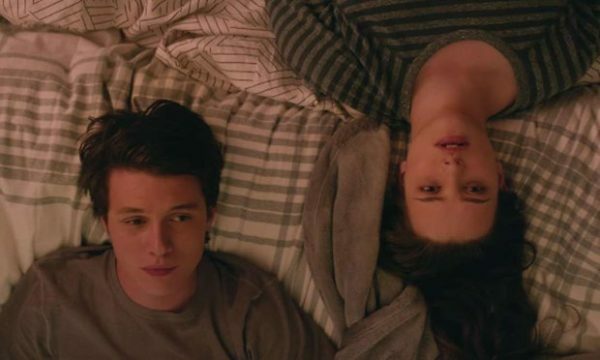 Also, much predictability of the narrative’s trajectory is offset by Love, Simon‘s mystery component, as it’s cleverly hidden as to who the student actually is. Visually, there are images of Blue Eyes that represents who Simon is assuming he is or what he believes the boy might look like, all drowned in an appropriate blue color palette. 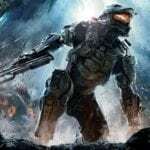 It’s an aesthetically pleasing tactic from director Greg Berlanti (a television writer for many DC shows) to ramp up the engagement of what is two people sending each other Internet letters, which itself is actually fairly gripping due to the strongly worded dialogue about their situations and lives. The problem is that Love, Simon milks some of the more familiar mainstream elements for all they’re worth; the ending must last nearly 20 minutes and could have effectively cut to the credits two or three times. Not to spoil anything, but I wish the movie had chosen not to reveal Blue Eyes’ identity and went for a closing shot centered on acceptance and family. There’s just too much in the last act that desperately needs to be sped up. On another note, some of the humor is either totally out of place (the school’s vice principal played by Tony Hale is a grating individual rambling on and on about his online dating experiences, cell phone fixation, and other nonsense that isn’t funny), or an over-the-top sequence of professing romantic emotions that is so bad I immediately checked online to see if it was also in the novel (as far as I can tell, it isn’t). 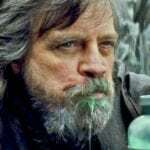 There are amusing one-liners thrown around between the friends and students that feel organic; it’s only when the comedy is forced that it becomes a bit unbearable. 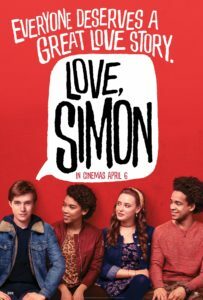 Love, Simon works best when it’s humor and romance feel grounded in the real world as the script (Elizabeth Berger and Isaac Aptaker) and direction are fairly good at presenting an authentic depiction of modern-day high school. 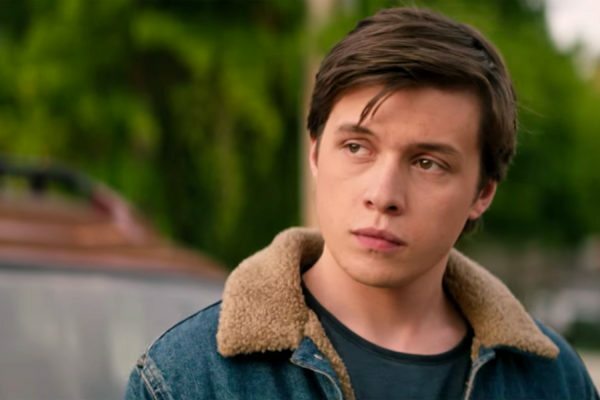 Finally, to address the elephant in the room, the fact that Love, Simon is arguably the first mainstream romantic comedy to feature a gay lead somewhat makes up for its plentiful genre tropes; all of this is being viewed from a fresh perspective. Occasionally, it feels similar, but there’s elation when Simon scores his first gay kiss (I’m not saying whether it’s with Blue Eyes or not). 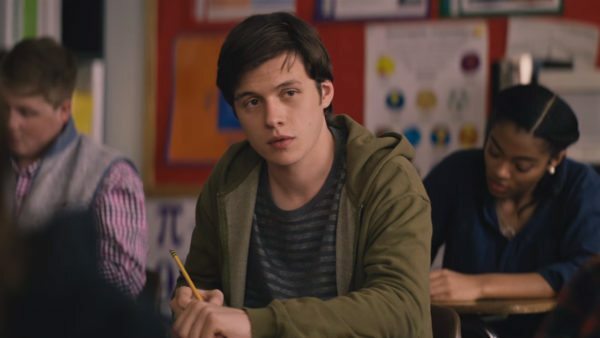 Forward thinking, new points of view, a terrific performance from Nick Robinson (he’s great at eliciting body language showing his stress from bottling up the secret, especially around his jokester father), some serviceable supporting turns, and a handful of lifelike interactions all weigh in favor of Love, Simon against its admittedly formulaic structure.